Note that the bus only runs a few times a day (apart from Ishigaki city). The information is in Japanese. It’s recommended to rent a car, if you’d like to see more of the islands and want to spend less time on travelling. Take a ticket after hopping on the bus. The number on the ticket refers to the numbers on the screen next to the driver. The screen shows you, what your costs are when going off the bus. This is also the moment to pay the driver. Suica, Icoca and other public transportation cards, which are working so well in Japan, can’t be used on the islands. The stops are mentioned in Japanese. Taketomi island has a bus service, however as a traveller you don’t really need a bus because it’s such a tiny island. A bike is the best transportation. Same for Hatoma island. On Kuro, Kohama and Hateruma island is renting a scooter (you need an IDP) or bike the best. 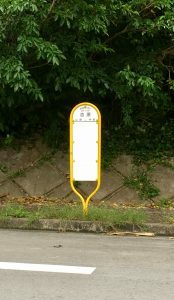 The bus on Yonaguni island is free. They don’t run frequently and the information is in Japanese. Basically on Ishigaki and Iriomote island it’s worthwhile (in some occasions) to use the bus.